Aside from the lv 75 requirement, the devs want to place a quest entrance restriction on your subclass level. 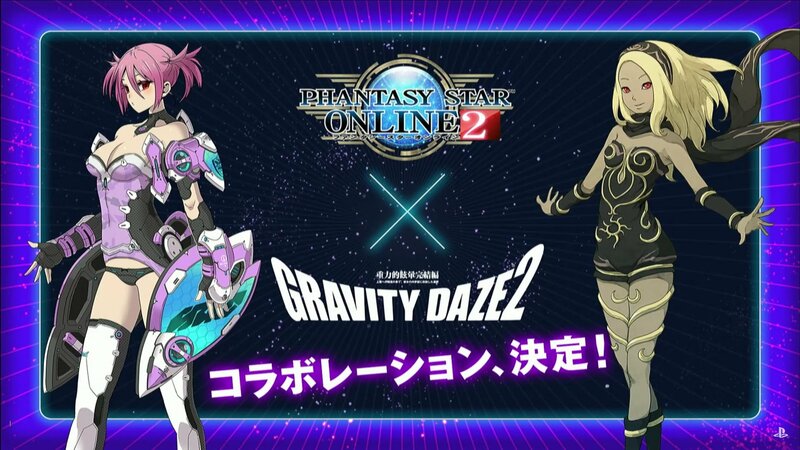 Gravity Daze 2 Collaboration has been announced. A mutual collaboration for both games. 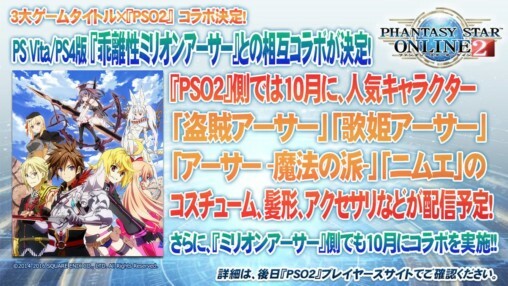 PSO2 will receive costumes, accessories, and hairstyles of popular characters from the game. Collaboration will arrive in October. Persona 5 costumes, hairstyles, and accessories will arrive in PSO2. The collaboration is expected to arrive this winter. A new Web Interlocking event starting this November. Famitsu Mascot “Necky” will show up in the ARKS Lobby. Emergency Quest: Challenges from Necky will be released along with the Event. This is a brand new [Defense] type quest. The rewards include many collaboration items. Quest Triggers will come included with the magazine. This program will contains update information and future developments. 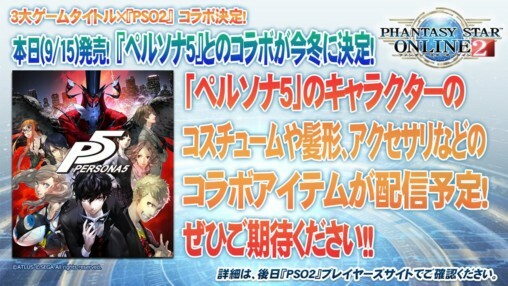 It will include coverage of other things both in and outside the game like merchandising and event information. 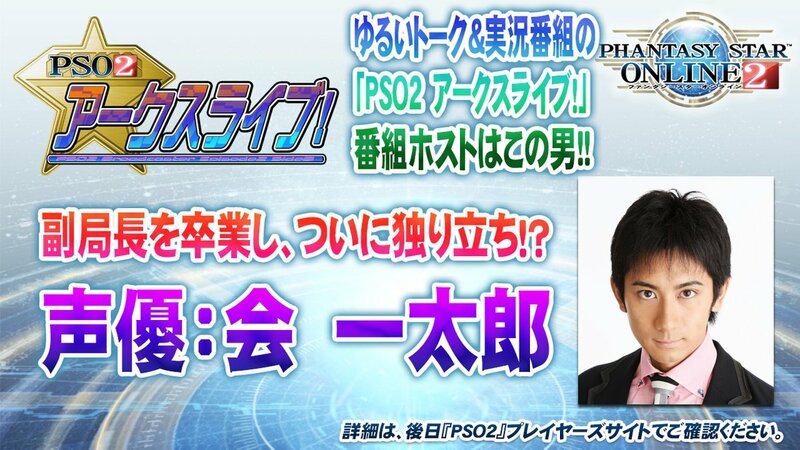 Hosted by Ichitaro and Kimura, this program digs deeper into the update with answers to questions from twitter. 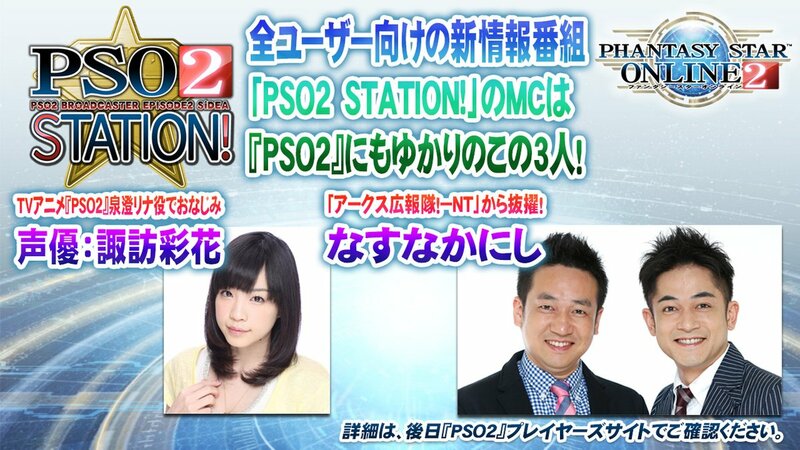 [PSO2 ARKS Live! One More!] contains let’s play content, along with gameplay of whatever update is coming up very soon. The first episode airs October 8th at 20:00 JST. I know, it’s such a shame… that he’s still around. Next they will think to include making sure you have all possible skill points for both your main and subclass. Go SEGA keep those easily circumvented requirements coming. better “easily circumvented” than “whale tax”. I’d rather not miss content because my RA is at a disadvantage in any solo scenario above VH because things won’t let her stand still and line up those headshots, and I lack the funding to buy a stack of scapedolls to cheese it with. it’s stupid anyway, because content gating serves as little more than reason to not bother with the associated content. I’m still waiting for them to get their heads out of their asses and give SHAQ the same base-entry-fee reduction that VHAQ got, so that it’s actually worth it for me to do them. I’ll probably be waiting untill the game’s scheduled end-of-life. Oh you’re still salty over that whole solo XQ thing. What whale tax? There isn’t single anything in the game that actually requires you to buy revives. They’re trying to bring base player power up to a point where they can design content for higher geared players, right now the bar is set so that really anyone can play this game and clear content with little to no challenge at all (worst case scenario is it just takes forever to kill things). The way they’ve decided to fix this is by making little requirements here and there so that by the end of the day, the base power players will be decently equipped and skilled so that there’s less skilled players complaining about players bringing things like +5 11*s and lucky rise units/ungrinded 7* units to the field, and more players bringing gear that they have worked on if even a little. As for SHAQs, they wont reduce that because then players will farm them for revo and tagami 13*s that can drop there very easily. where as VHAQ is just for exp, you’ll be lucky to find a few 10*s there while farming exp. I don’t see a huge problem – anyone who’s played this game for even a moderate amount of time should have at least one 75/75 char/class they can play. If you’re not there yet – use the EXP Boost tickets, triboosts, EXP boosts – Bonus quests give lots of EXP – LQ, EQ, AQ – you’ll be there in no time. Mhm, that’s a pretty basic requirement. You can easily grind a few quests with all the triboosters they give out nowadays, and raise your subclass to 75. Easily got my subclass on one of my characters from Lv65 to 75 in 2-3 days. Yeah if you make that your goal – it is achievable very quickly – I found my time to sub 75 to be about the same – slightly faster cause I used boost tickets and all class weapon to use my sub’s skills – but still – not a problem at all. clear solo XQ please. make it quest/class like SP quest..